It’s funny how life can be so unpredictable. Some may be tempted to replace “funny” with frustrating, discouraging, exciting, or fun. 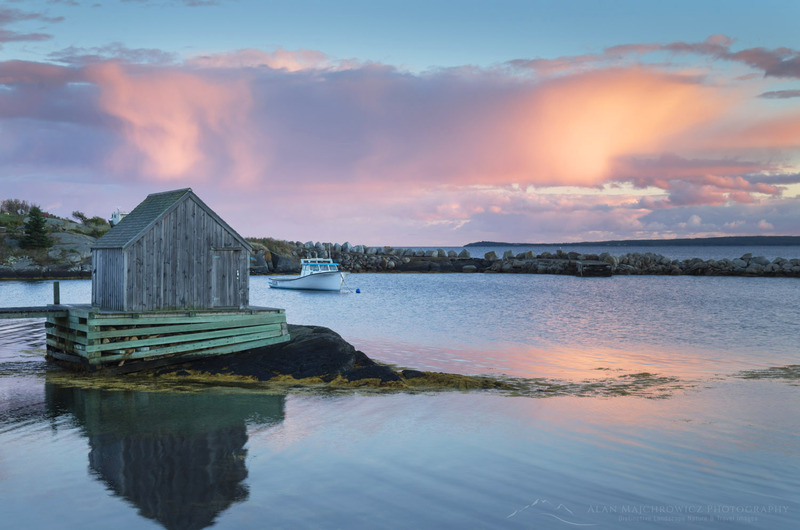 Last year at this time I was on a dream trip with my wife Coleen to photograph in Nova Scotia and New England. This year I’m stuck at home in the office, working on marketing and fantasizing about future trips. So since I’m not able to get out on the road anytime soon, the next best thing is to relive last year’s trip by writing blog posts. In my last post I wrote about our brief visit to the Bay of Fundy in New Brunswick. 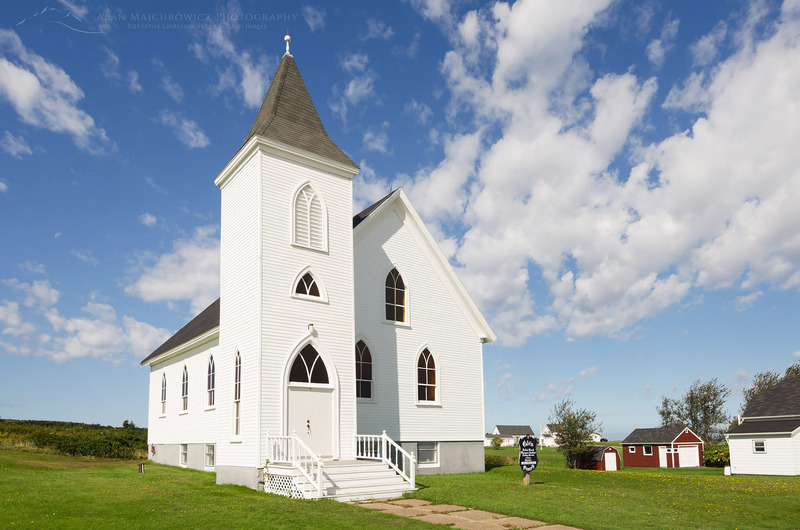 In this post I’ll be recapping our visit to Cape Breton Island Nova Scotia, one of the main highlights and destinations of the trip. As with any new location I hoped to see as much of the province as possible. 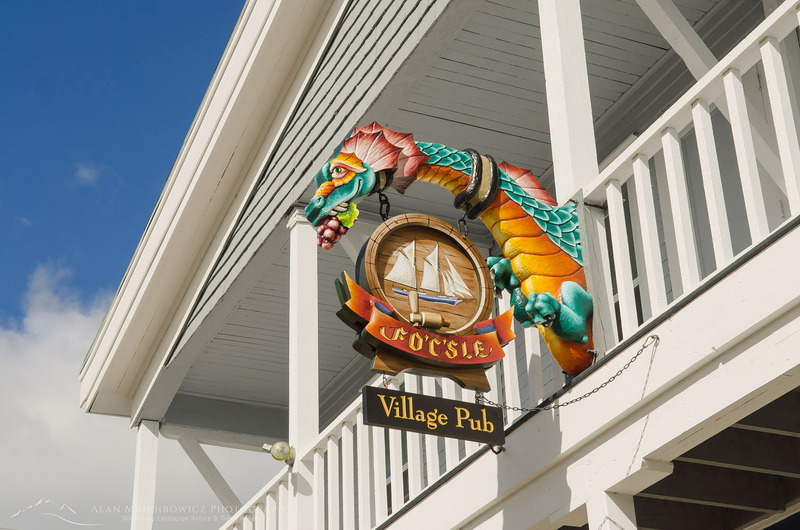 We had to carefully choose only a few of the best locations to visit in our available time. 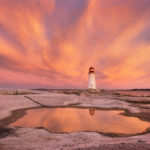 After years of poring over Nova Scotia maps and images I settled on a couple of areas. 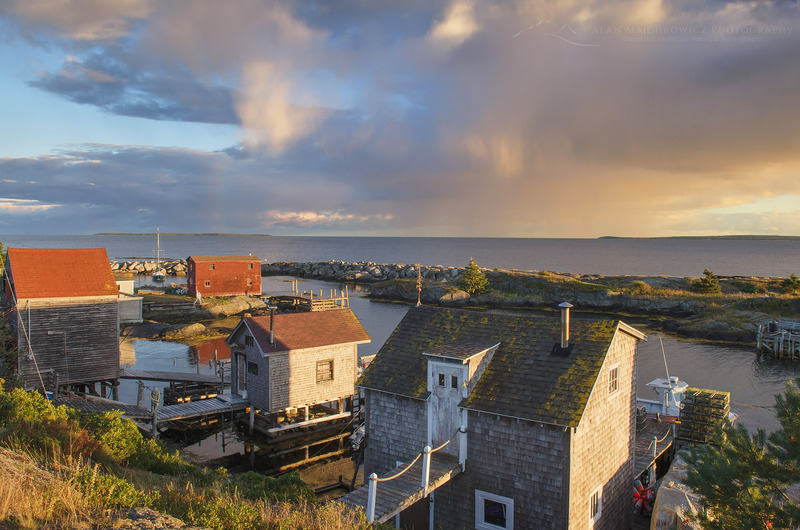 For me Cape Breton Island and Peggy’s Cove Coastal Region were obvious choices. 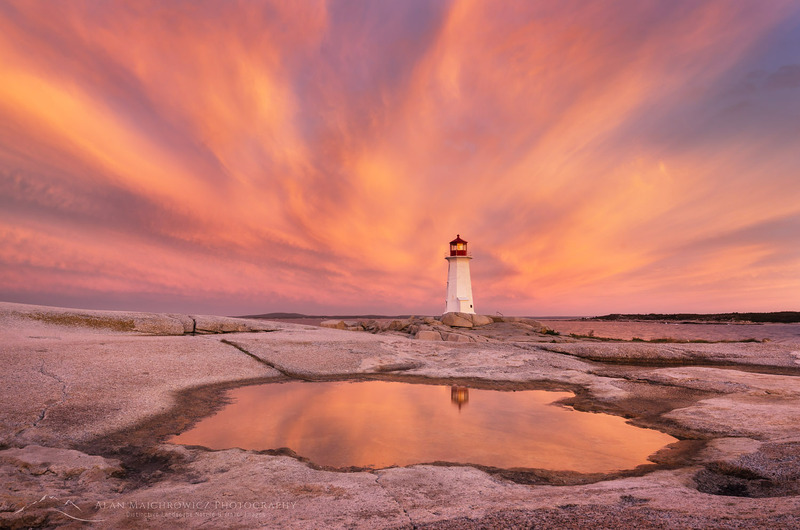 Cape Breton Island represented the rugged wind swept character of the Canada’s Atlantic Provinces. 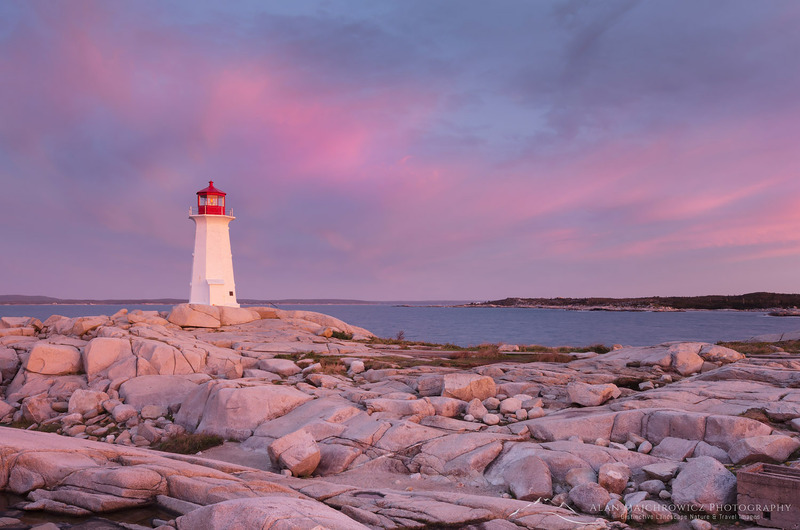 While Peggy’s Cove Region highlights the historic and thriving culture of the province. 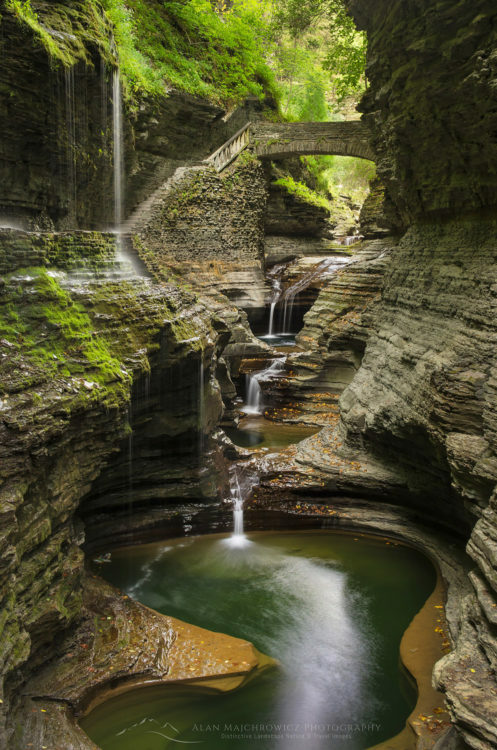 There is, of course, much more to see, but these locations will make a good start. After leaving New Brunswick we drove straight to our first destination, Cape Breton Highlands National Park. On the map it looked like about a half day drive. In reality it took us most of the day to arrive, exhausted from driving, at Chéticamp in the park. Of course we had to make a few stops along the way. 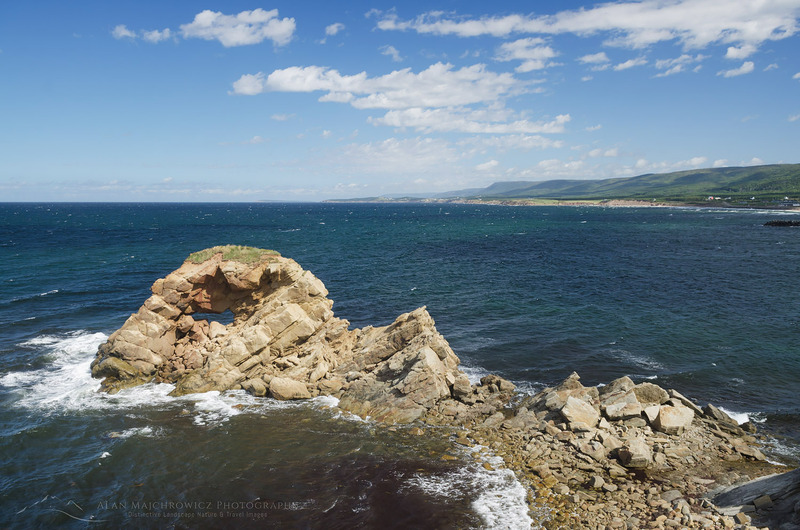 Part of the appeal of Cape Breton Island is it’s Scottish heritage, most notable along the Ceilidh Trail. 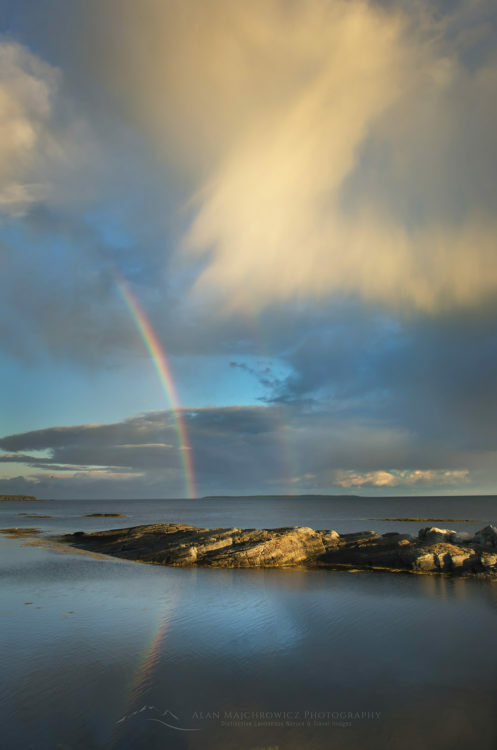 Picturesque Ceilidh Trail (pronounced Kay’-Lee) runs along the west coast, and has its road signs written in both English and Gaelic. 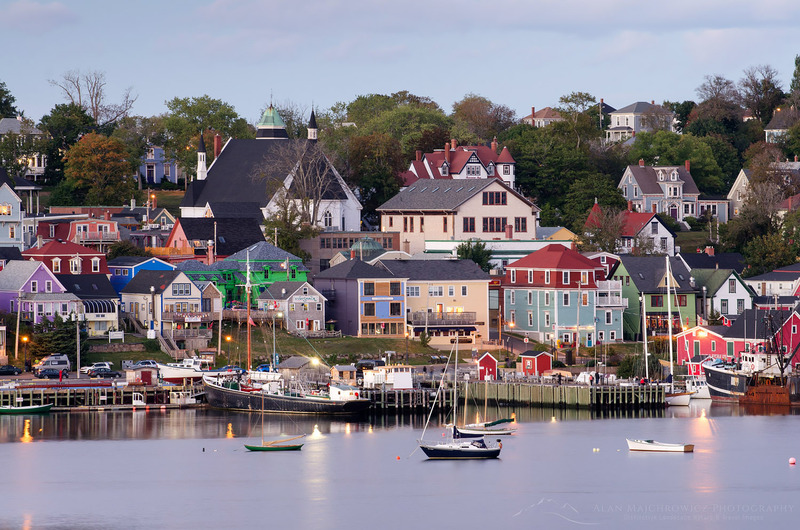 Along the way are quaint villages, world class seaside golf courses, and North America’s first single malt distillery. 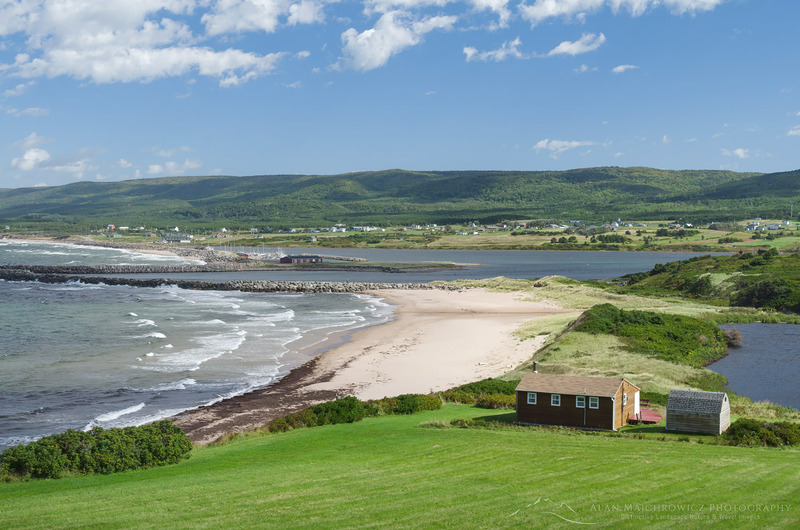 Further north the Ceilidh Trail gave way to the world famous Cabot Trail. 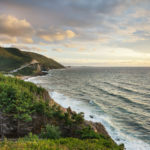 Possibly the most scenic drive in all of Atlantic Canada, the Cabot Trail encircles the entire northern section of Cape Breton Island. During our visit we focused on the western section of the trail, from Margaree Harbour in the south to Pleasant bay in the north. Arriving in Cape Breton Highlands National Park was exhilarating. We were just about as far north in the province as we could drive. The land had begun to take on a wilder primordial feel, even more evident high on the Cape Breton Plateau. There were few towns, and those being very small fishing outposts. Although Cape Breton Highlands lies only at 46º north, I had the feeling of being on the southern edge of the vast expanse of Canadian subarctic lands. I imagined that if I squinted hard enough I could see Newfoundland, then Labrador, and finally Baffin Island. I should state here that for most of my life I’ve had an obsession with everything arctic. Especially the Canadian Arctic, which holds a tight grip on my imagination, partly due to it’s rich and often tragic history of exploration. 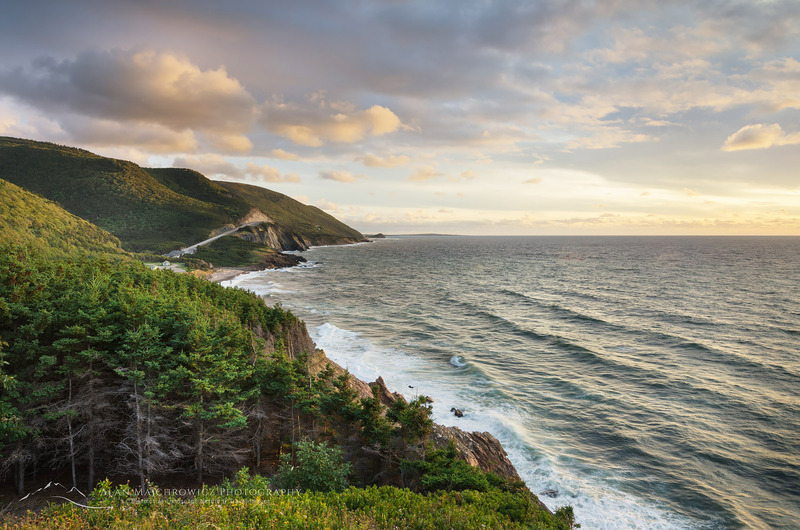 After setting up camp in Cape Breton Highlands National Park I anxiously began to scout out the coastal drive. 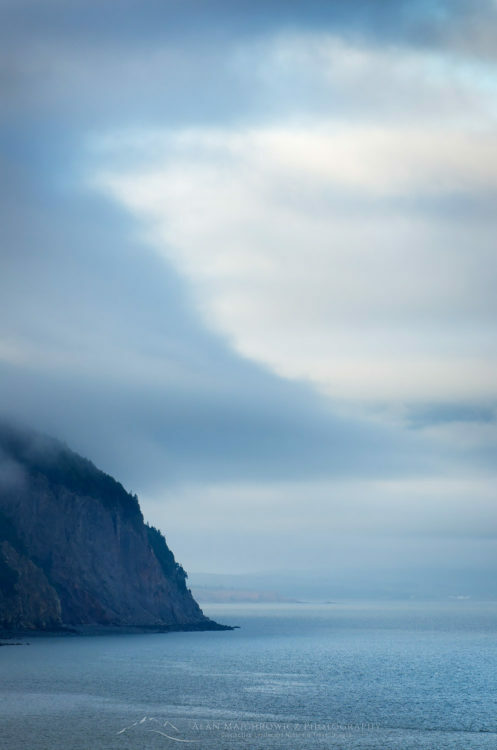 Along the west coast the Cabot Trail climbs high and has stupendous views of the Gulf of Saint Lawrence. 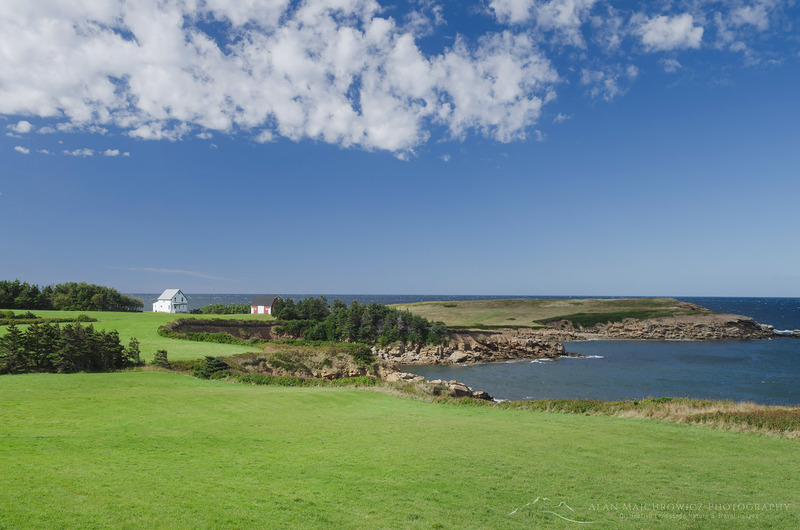 At its height you can see all the way to the Magdalen Islands, situated nearly in the center of the Gulf. I like to think this section of the Cabot Trail is Canada’s east coast version of Big Sur in California. After winding up along the coast the road heads inland to the plateau highlands and a dramatic change of scenery. 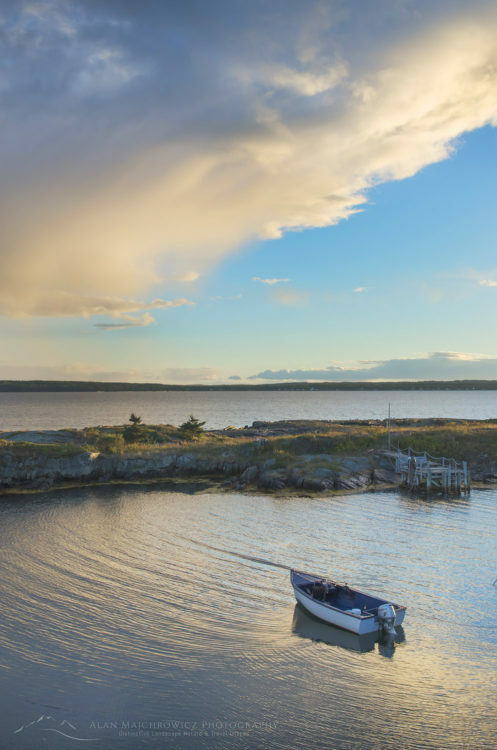 Dominated by boreal forest with a distinct sub-arctic feel, the Cape Breton Plateau is a windswept wilderness of barrens, bogs and lakes. Most people think of the Appalachian Mountains ending at Mount Katahdin in Maine. However, geologically they continue much further north. Cape Breton Plateau is actually an Appalachian mountain worn down by glacial activity. 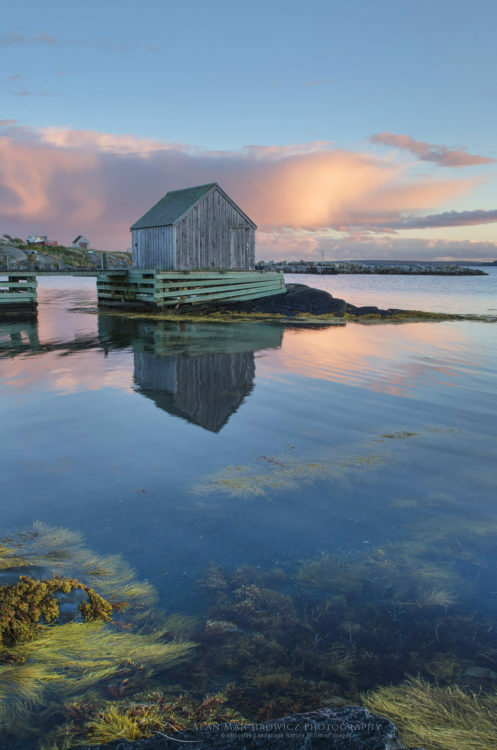 To reach the true end of this ancient chain of mountains you would need to travel as far as the highlands of Gros Morne National Park in Newfoundland. 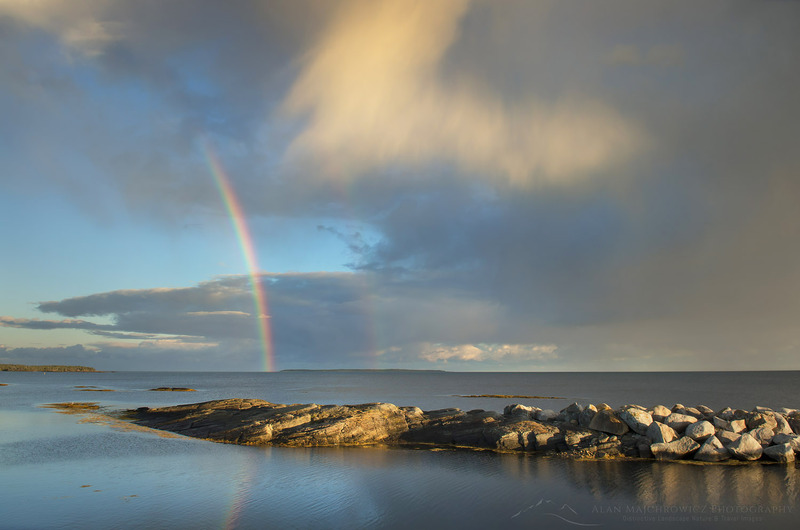 Since the weather was grey and forbidding on the plateau I headed back to photograph the coastal drive in evening light. While in the park I wanted to hike the Skyline Trail to photograph the iconic view from the top. 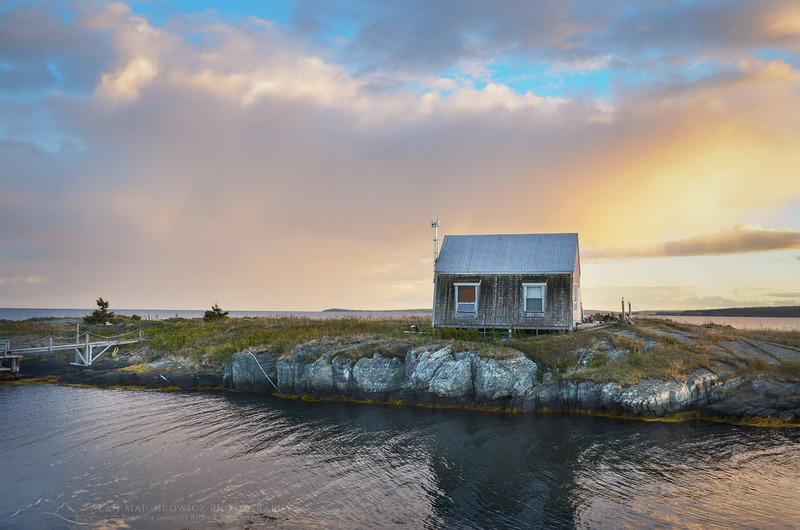 At the end of the trail a dramatic headlands cliff overlooks the winding road and the vast expanse of the Gulf of Saint Lawrence. 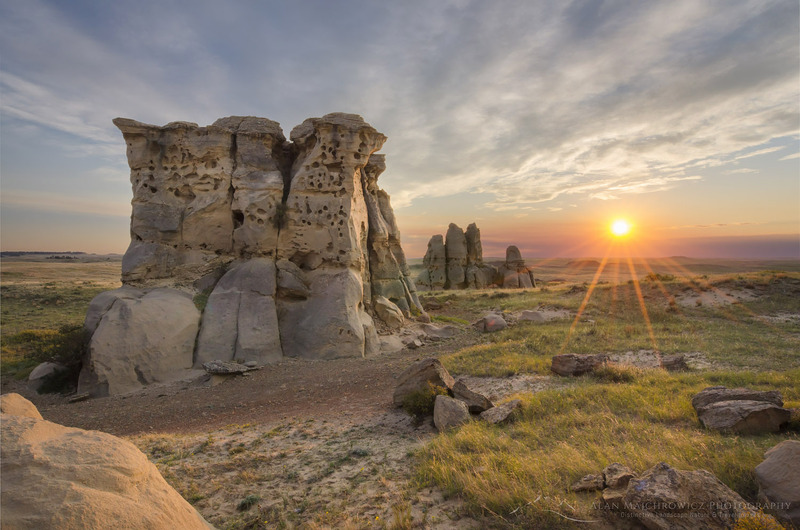 This trail and view is one of the hallmarks of the park. However, my timing to get there was poor. I failed to take the length of the hike into consideration, it would’ve been dark by the time I made it there. I was fortunate to drive to an alternate overlook just in time make a few photos of evening light breaking through the clouds. 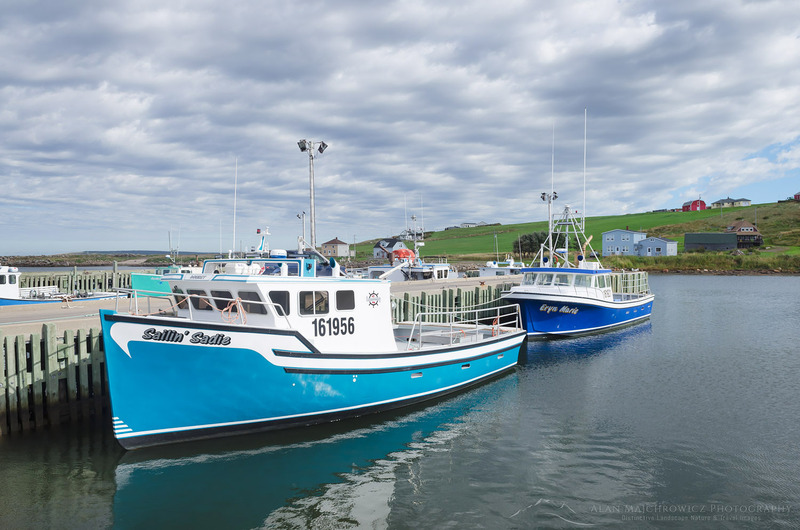 The next day Coleen and I drove south to scenic Margaree Harbour to photograph fishing boats and coastal views. 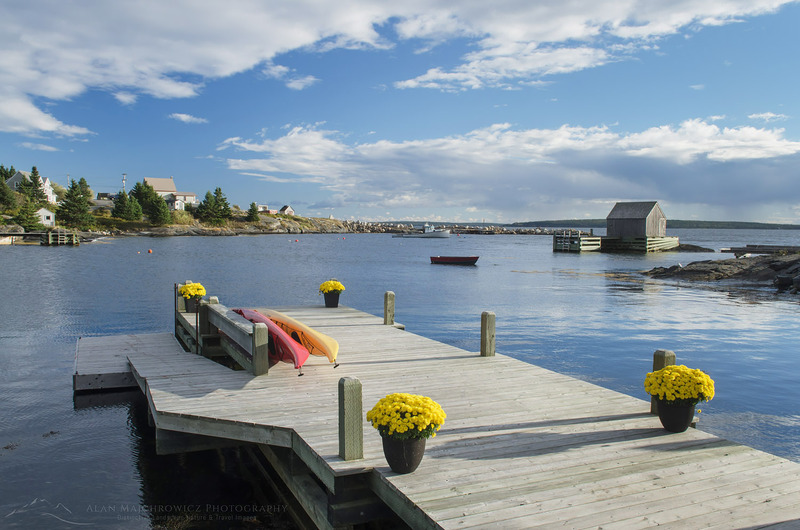 I really enjoyed this area, there were picturesque seaside farms, sandy beaches, churches, and colorful boats. 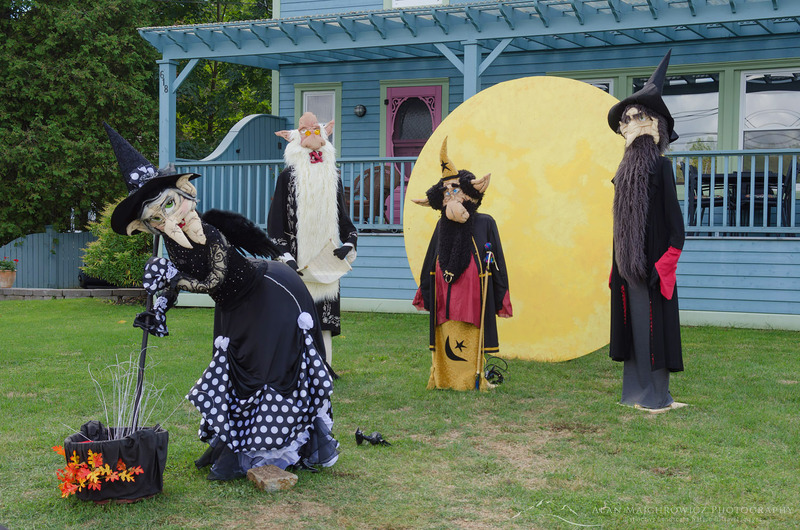 An interesting find was Centre de la Mi-Carême, an interpretive center focusing on the Acadian celebration of Mid-Lent with masks, music, and dance. Attracting us to the center was the display of colorful effigies on display in the parking lot. Unfortunately our visit was cut short as the center wasn’t open at the time. Back on the lobster hunt, as we found out in New Brunswick, lobster was out of season. However, we were lucky enough to find that in Margaree Harbour the Island Sunset Lobster Pound still had some some available. After chatting with the friendly owner and a patron about our travels we hurried back to camp to cook our long anticipated crustaceans. In the warm afternoon sun we made a glorious mess of cracked shells lobster meat and melted butter! This was the way to do it, out in the open air by the sea, not in a stuffy restaurant. In the evening, and again the next morning, I went out to make photographs along the coast. I had some nice light for photography while in the area but it didn’t last very long. 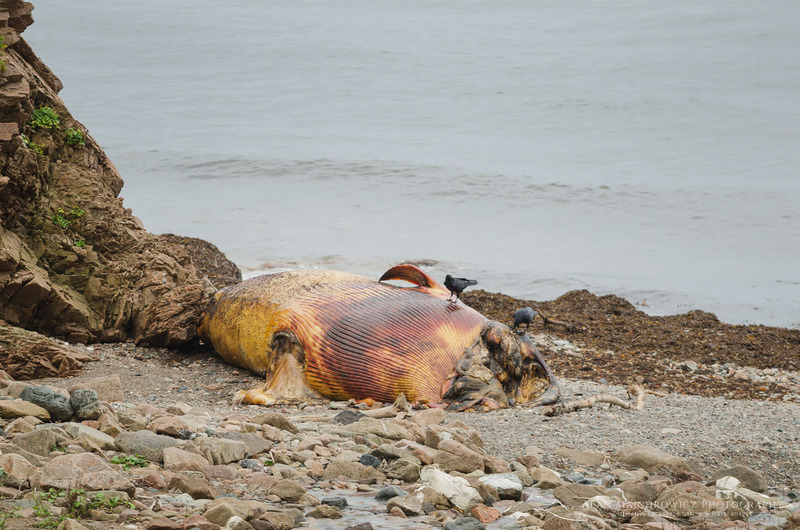 I came back with only a few new images, including one of a beach whale, headless and rotting on the beach. This is usually the situation when visiting a new location. 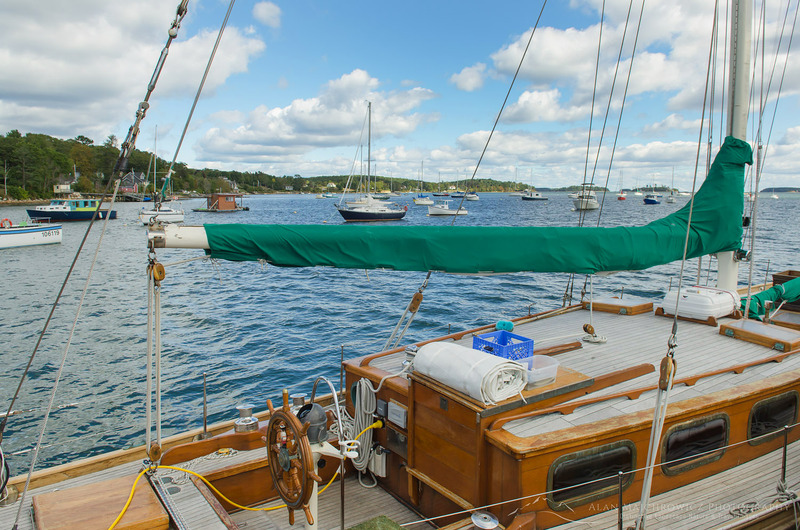 Without prior firsthand knowledge of a location it’s difficult to be in the right place at the right time. In my experience I might get lucky a few times on an initial trip. But it normally takes several return visits to really understand the its character. There are some spots from which I still have not created a defining image, although I’ve been there many times and know it intimately. 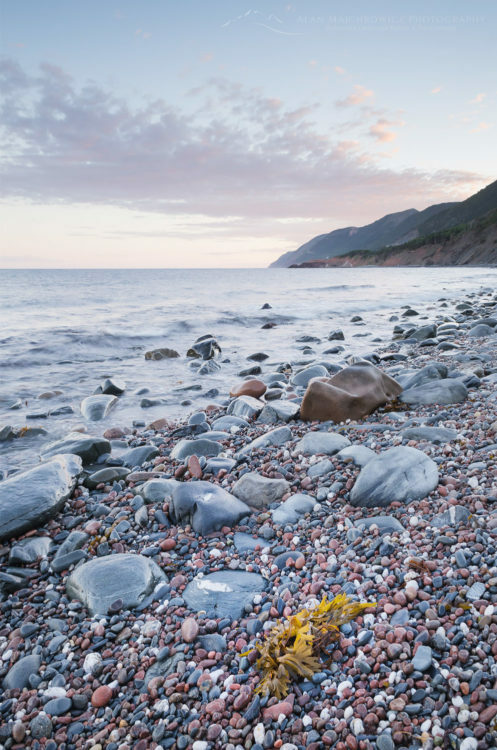 After packing up our camp we began our drive north and over to the Atlantic side of Cape Breton Island. At Green Cove we got our first real view of the Atlantic Ocean. Getting out of the truck to stretch our legs I found this to be a great place for photography. 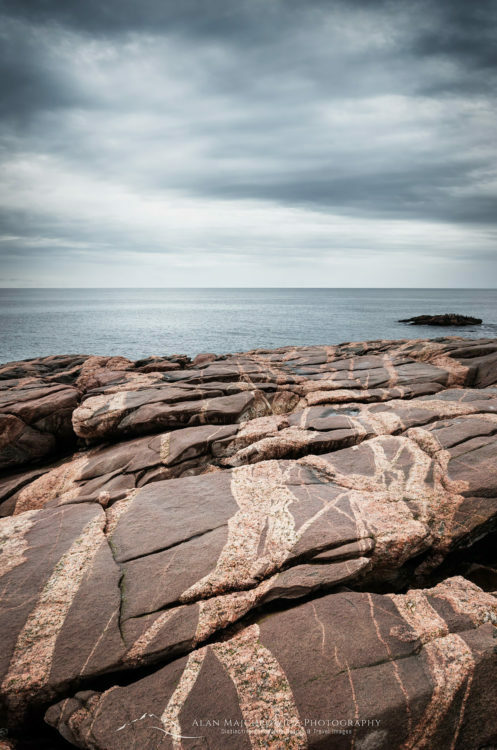 The headland is composed of beautiful pink granite laced with striped intrusions. Given the right lighting conditions I could spend hours here photographing the fascinating patterns. Unfortunately a storm front was arriving with the first drops of rain which lasted all day. 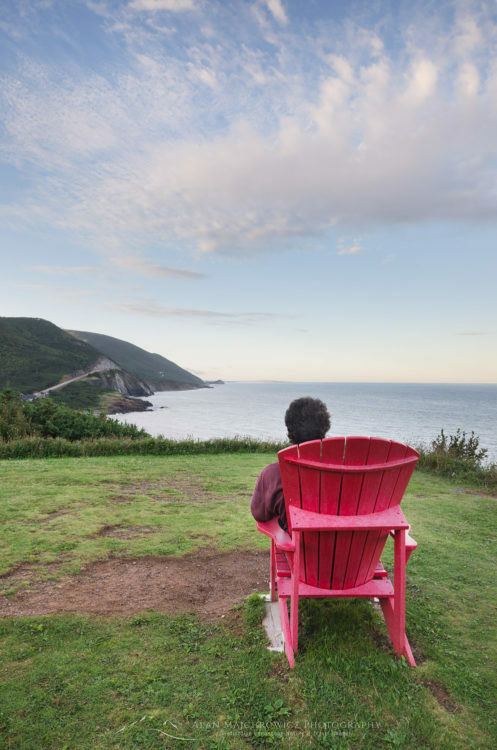 I wished we had better weather and more time to stay and explore beautiful Cape Breton Island. One of my biggest regrets was having to pass up a visit to Fortress of Louisbourg National Historic Site. Located on the far eastern edge of Cape Breton Island, the fort is a wonderfully preserved 18th century military installation. 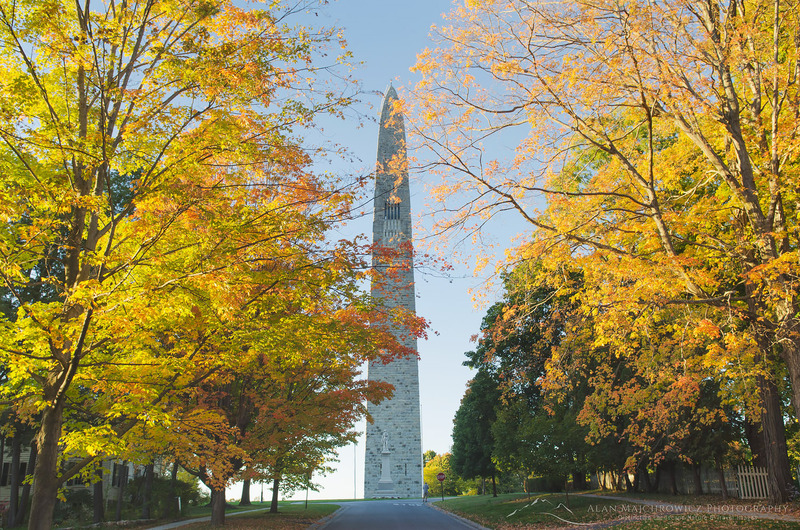 Among activities here are interactive tours and reenactments of 18th century life. 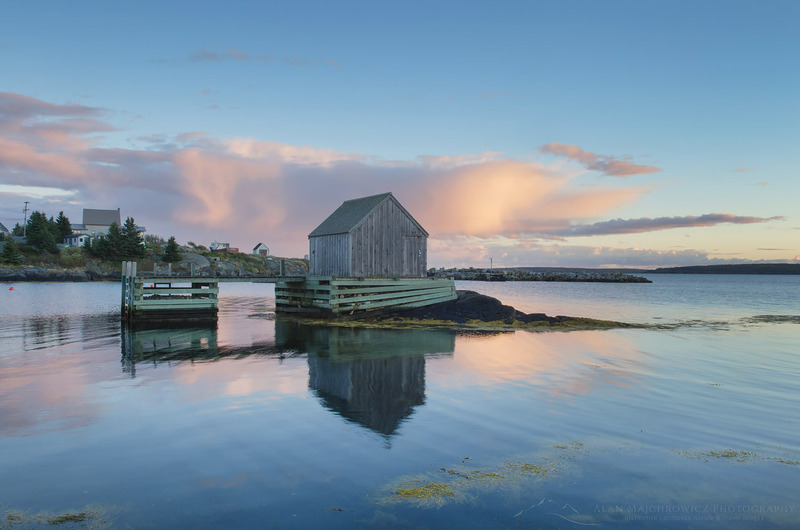 Including Louisbourg on our trip would’ve meant excluding other important locations further on. 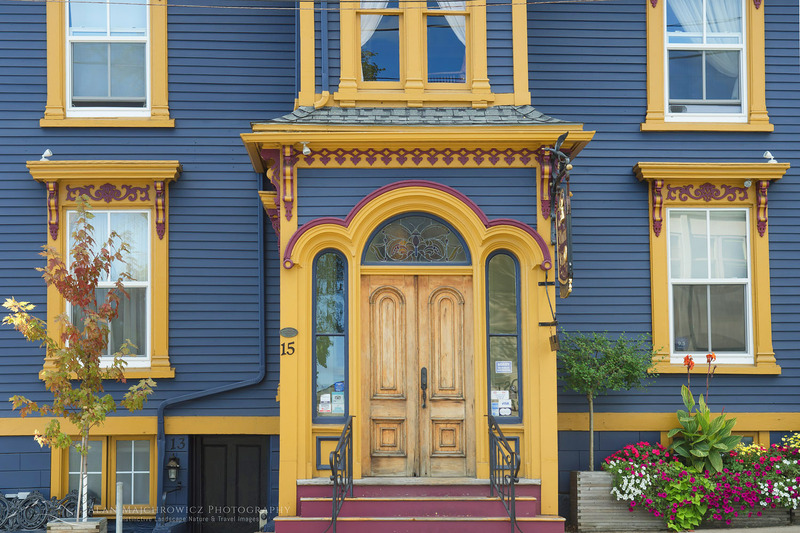 And I definitely didn’t want to miss out on photographing iconic Peggy’s Cover and historic Lunenburg. So it was onward into the rain, and part two of this post! 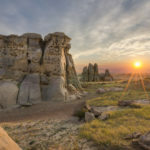 I’m thrilled to announce the first group of new images from my recent photo tour is now complete. You can check out a portfolio of selected images here or by clicking on any of the images appearing in this post. To view the entire edit all of the newly added images, go to our Stock Images page and click on the location you’d like to see. The second half of all the new images should be ready for viewing in the next week or two. 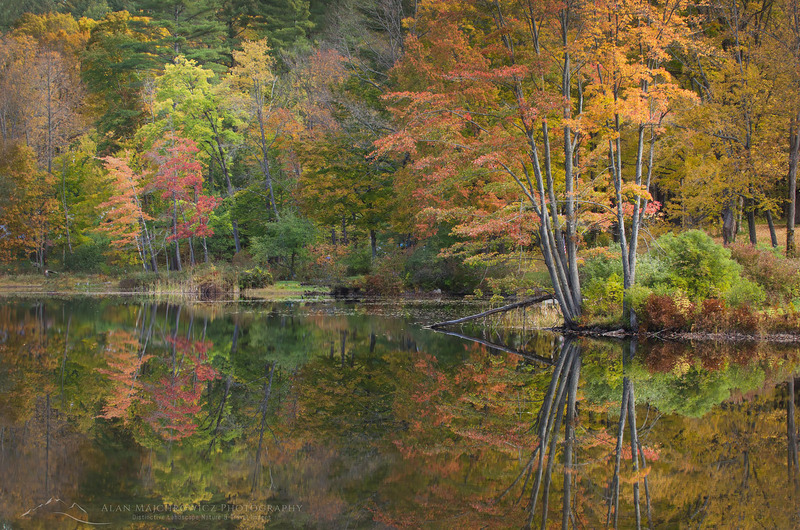 That group of new images will include Maine, New Hampshire, Vermont, and Pennsylvania, with the main subject matter being fall color. Check back here soon or sign up for email updates to be notified of promotions or image news. I’ll also be adding regular in-depth posts here about specific locations and subjects covered on this trip.